The Dodgers would utilize that Bear Mountain Inn/West Point Military Academy training camp for 3 full seasons until 1946 when travel restrictions were finally lifted. 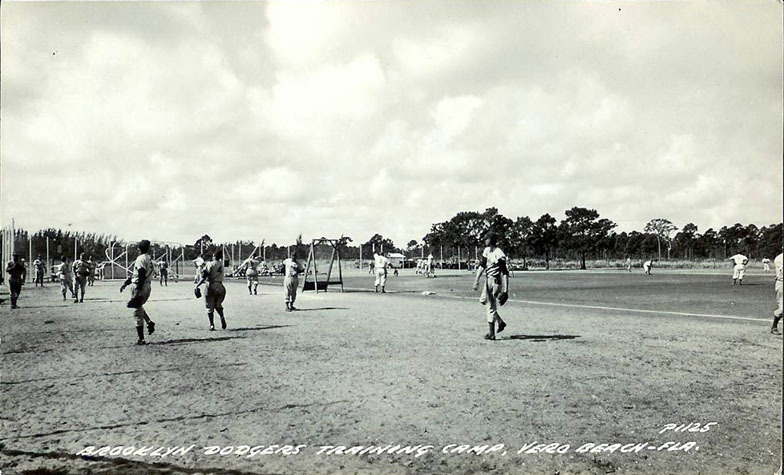 When the Dodgers returned to Florida in 1946 to train at what would be known as "Jackie Robinson Stadium" (then called City Island Ballpark), in Daytona... they found that, being away from the West Point Academy would mean to a lack of safety for the ballclub. The whole time that the Dodgers played at "Jackie Robinson Stadium, Jackie Robinson's life was in danger. The movie "42" (which we proudly, were the ballpark consultants for... choosing and securing those ballpark shooting locations for the film), goes into great detail just how dangerous it was for Jackie during this time. The Dodgers decided that after 1 year training there, they could no longer train in a location that the general public could have access to. That is why the Dodgers wound up in Havana Cuba in 1947 and in Santo Dominico (Ciudad Trujillo) in 1948, until Branch Rickey came up with the brilliant plan, to buy a military air base that the team could own and fly into (the way they had utilized West Point during the war).